As a CRUX fellow coordinating the Los Angeles cluster I have been working with California State University Northridge (CSUN) as well as Los Angeles Valley College to increase resilience and implement the Commitments. Over the past summer, Lily House Peters from California State University Long Beach (CSULB) contacted, amongst others, Austin Eriksson, at CSUN to see if anyone would be interested in taking part in a resilience training event. The training would focus on the Community Resilience Building workshop process. We were eager to participate, and immediately offered our campus as the location for the training. I was excited at the opportunity for the CSUN campus to host a training event, because the next phase of our work is focused on campus-community collaboration. Along with CSUN and CSULB, representatives from California State University Los Angeles (CSULA) were also able to attend, as well as the other two CRUX fellows, Brian and Thea. The training was led by Adam Whelchel from the Nature Conservancy. Adam began by explaining the process of preparing and facilitating conversation at the workshop. He discussed the importance of bringing together the right group of people and how to create enthusiasm with common goals and engagement. Once we were all familiarized with the process we began setting up for a role playing scenario with a hypothetical campus and community. The Community Resilience Building Workshop Risk Matrix that Adam provided to us was printed with pre-determined hazards, as well as pre-determined strengths and vulnerabilities for the three elements: Infrastructure, Societal and Environmental. We were also given some information on the campus and community such as the flooding patterns and which buildings were vulnerable to specified risks. We were split into two groups of about 8-10 people and everyone was given roles to play, such as the campus facilities manager, a concerned community member, a nearby land developer and other people we would likely want to include in our own workshops. For this role playing experience it was important that these people didn’t have the same views and opinions. The roles required us to disagree and argue for our own priorities and goals for the community. The two groups worked to come up with actions that can be taken to help improve “their” community’s resilience to the natural and other climate related hazards that were provided to them. Once we finished listing the actions we then prioritized them, and categorized them into long-term, short-term or ongoing actions. After the groups completed their matrix we came together and briefly explained our top three priorities. Adam discussed how we can then arrange the topics to identify mutual concerns and reach common ground. I found that the discussions we had during the role playing activity were the most helpful for preparing to host a workshop. It was interesting to hear the language used by the facilitator; facilitators need to validate each opinion but also work to find consensus. The workshop was not only a great learning opportunity but also a great chance to meet those involved in similar projects for CSULA and CSULB. 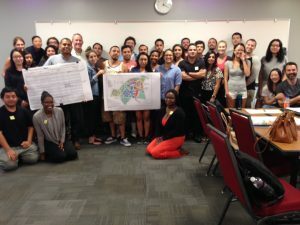 I spoke with Lily House Peters of CSULB after the event to see if they might need any help hosting their Community Resilience Building workshop. I am hoping that by seeing the whole process, I can begin to understand how I can help to facilitate the process for CSUN as well as LA Valley College. The second day involved training the graduate students of CSUN who will be conducting most of the research involved in Los Angeles clusters’’ resilience assessment, as well as hosting the Community Resilience Building Workshop for CSUN in mid-November. Meeting the other fellows for the first time was also a great experience; we were able to discuss our work, plan for AASHE, get dinner and go to a yoga class all while they were in Los Angeles. If you are interested in hosting a Community Resilience Building workshop, or attending a Train the Facilitators to learn about this process, please contact Ruby Woodside, rwoodside@secondnature.org.